In the previous section of this guide we presented the base version of pricing, related to the management of customization costs of final product. Based on few parameters, this version is limited and it doesn't allow you to set a price list that fits your needs. 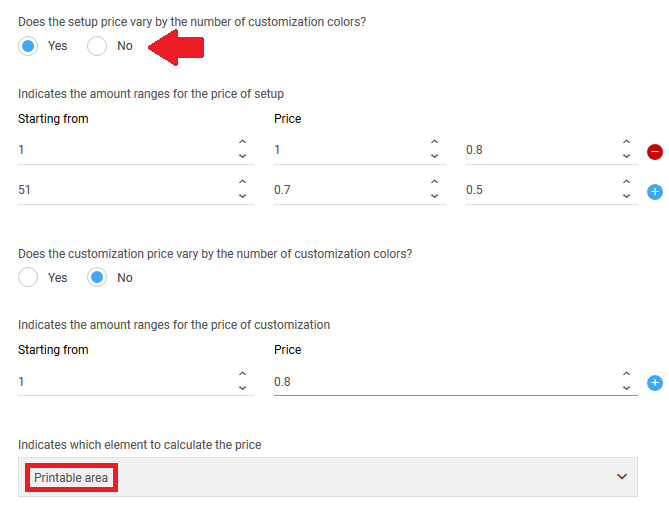 Indeed, in this section we're going to analyze the advanced version of pricing which has a larger set of parameters totally customizable. Note: advanced pricing is available only for some pricing plans. Be sure you've chosen a plan with advanced pricing before proceeding, or you'll be able to manage only the base version. During the product configuration, into the window of pricing settings, choose one of the printing methods from the list. After your choice, you'll see an hierarchy of elements put into a tree that you can explore by opening and/or closing branches with symbols + and - . Printable area - it's one of printing areas inside a given side. The number of printable area elements is the number of printing areas, set for a specific side of product. Only next to color elements there's a checkbox (checked by default) that allows you to include / exclude a product variant from the selected printing method. Note: be sure that every variant is set in at least one printing method, and that every printing method has at least one enabled variant. For all elements of hierarchy, by clicking on Add price you can see the setting costs view. Application to variants - indicates if current settings must be applied (replicated) on all product variants. Besides, you can specify if the price depends on the quantity of colors inside the customization done by your clients. With this option enabled, it's necessary to set the price for the first color used and for the remaining ones. Note: if you enable this functionality, the maximum limit of colors that images can contain is 10. By this way, every photo or every image which has shades can't be used for the customization. You can set the price range you prefer by clicking on + on the left. As soon as you save your settings, you'll see a marker of pricing enabled on the side of the element for which those settings are applied. Note: the color of marker is merely suggested and it isn't linked to the color of product variant. The elements with the same marker have the same pricing settings. If you want to see a summary of the pricing settings you can point the marker with cursor or finger, while if you prefer to delete them you have to click on X . At the end of the entire process, the aspect of hierarchy will be the same as shown in figure. Into the example, all color elements have the same pricing settings (green), while the remaining settings have different values. 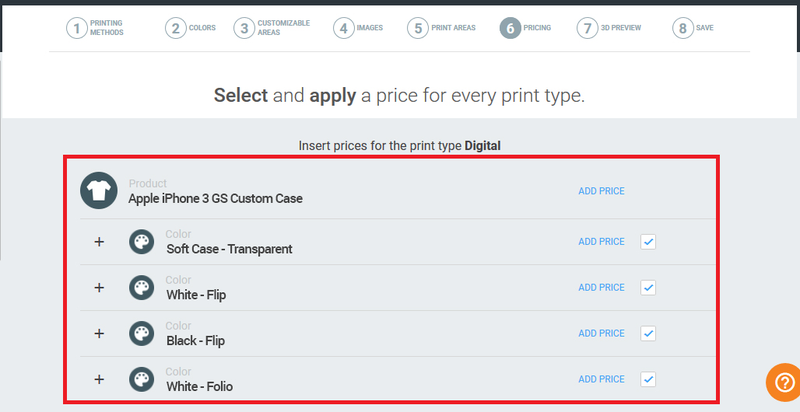 With a pricing like this, the final cost of customized products will be calculated on the quantity of product, on used colors and on number of printing areas and/or sides that your clients will use. Note: pay attention on the values inside the element selector because the final price of product is due to the combination of sums and replacements of costs for single elements. Take a look on the following examples. T-shirt uomo - pricing with advanced settings. Use case: you want to set pricing settings of product mousepad so that all its variants have the same pricing, except for the mousepad with the heart shape that has higher setup and customization prices. Into the pricing window, choose the printing method to be configured in order to see the hierarchy of elements as shown in figure. Click on Add price on the side of first variants into the list and set your pricing according to your needs. By applying the same pricing to the whole variants, the system assigns the same pricing to all color elements of the list. Let's continue with the pricing for the variant bianco cuore (white heart): delete the pricing already set for the variant and create a new pricing. With the new settings, the hierarchy will be as shown in figure: the variants bianco rettangolare (white rectangle) and bianco tondo (white circle) have the same pricing, whereas the last variant bianco cuore (white heart) has another pricing settings, different from the others, with higher costs. The costs into the example are applied on the product and not on number of customizable / printing areas used. This is due to the value of element selector, set on Global . for a total of 52.
for a total of 163. Note: costs must be valued into your currency. 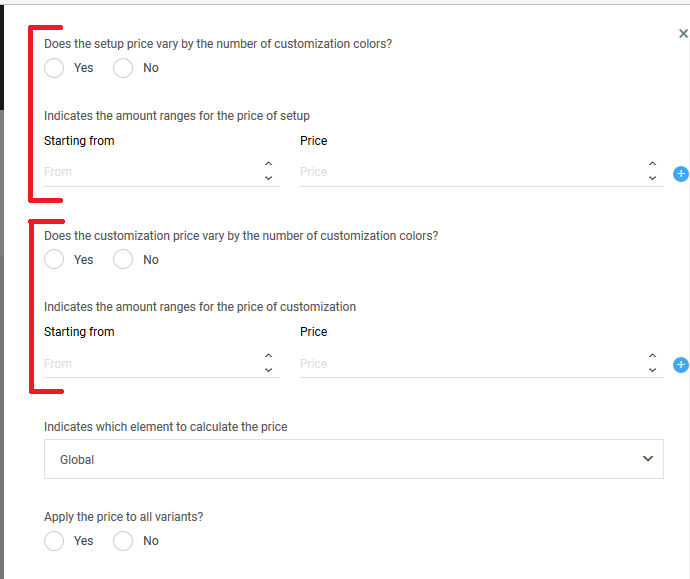 Use case: you want to set the pricing of product t-shirt uomo (t-shirt for men) so that all variants have the same base price with setup cost variable according to customization colors, that Blue and Red variants have a lower setup cost and that the side Front (of each variant) has a higher customization price. Click on Add price on the side of product element into the list and set your base pricing, with variable setup prices according to customization colors. 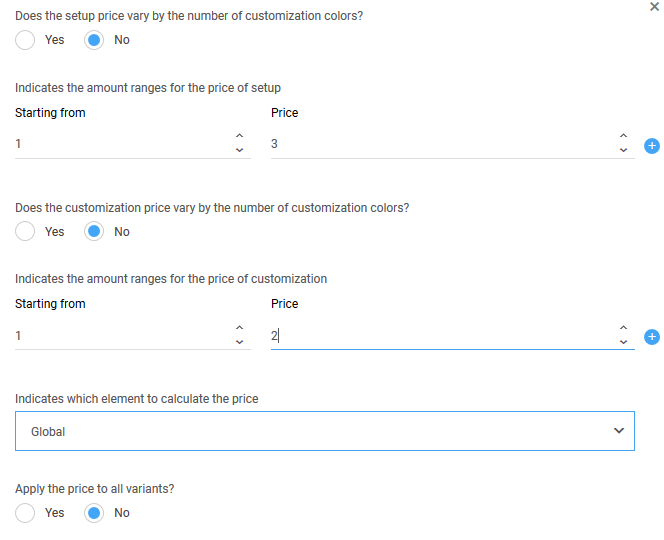 Set on Yes the variable cost according to colors and fill out all the field and the pricing range. 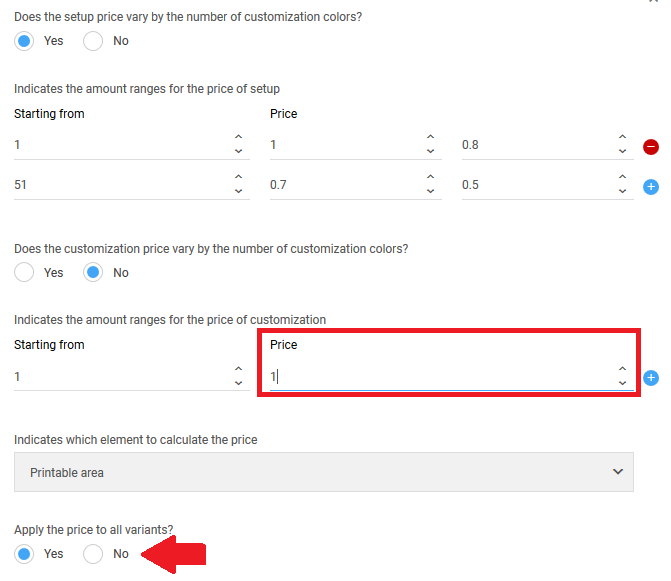 Note: when at least one option on variable price is enabled, the element selector is automatically set on Printable area . This is due to the need to count the number of used colors for the customization for each printing area and not only on side or on the entire product. 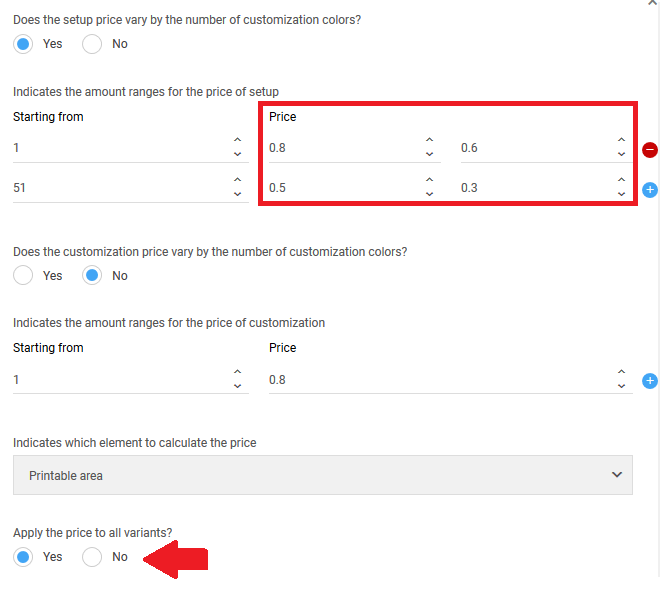 Now, set the pricing for Blue and Red variants by clicking on Add price . Insert lower setup prices, and apply the same price to all variants. By this way, you avoid to repeat the same operation for all variants. Delete the pricing just set from all variants that don't need it. Now, open one of the branch until you reach the level of sides. Insert the price for the side Front . 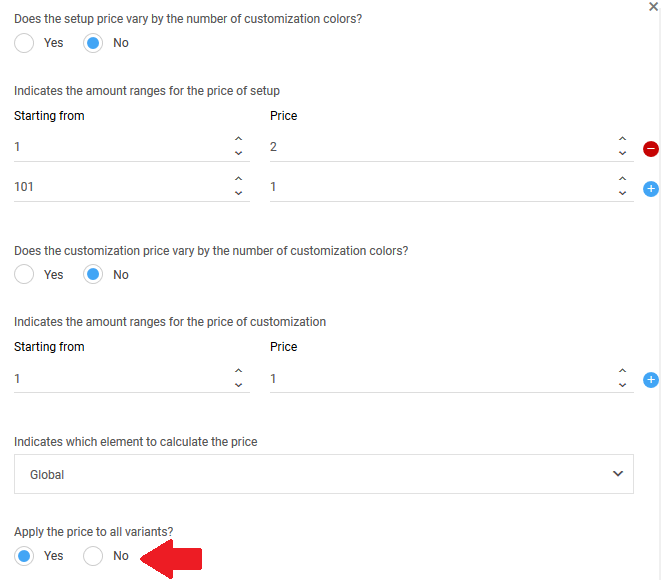 Be sure to insert a higher customization price, and apply the price to the whole variants. At this point, all Front areas inside product variants have the same pricing, and the process of pricing configuration is ended. for a total of 8.8.
for a total of 10.6.
for a total of 113.4.